WASHINGTON -- Hours after returning from the G-20 summit in Hamburg, Germany, where he had his first face-to-face meeting with Russian President Vladimir Putin, President Trump tweeted Sunday morning that "it is time to move forward in working constructively with Russia!" 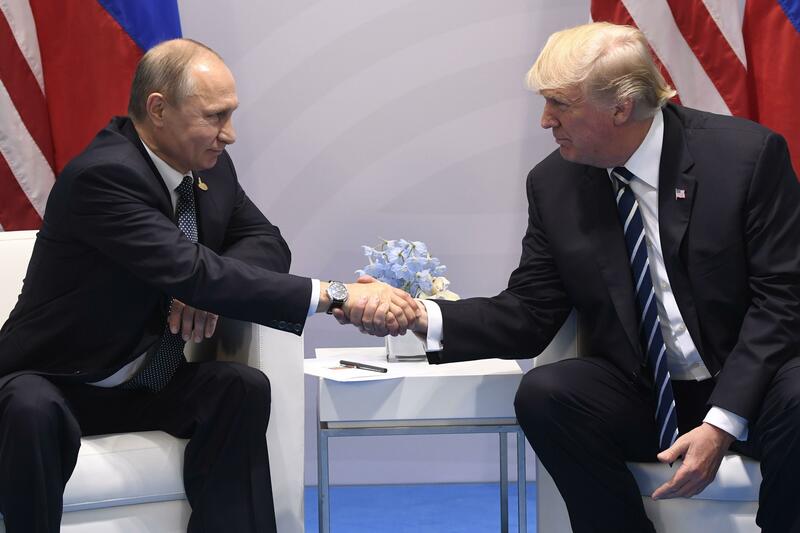 Mr. Trump recounted his meeting with Putin in a series of tweets, saying he "strongly pressed" the president on Russian meddling in the 2016 U.S. election, and that Putin "vehemently denied it." "I've already given my opinion," Mr. Trump tweeted. He continued: "We negotiated a ceasefire in parts of Syria which will save lives. Now it is time to move forward in working constructively with Russia!" He was referring to a cease-fire brokered by the U.S., Russia and Jordan that went into effect on Sunday. Mr. Trump also tweeted that he and Putin discussed forming an "impenetrable Cyber Security unit" so that election hacking and "many other negative things" will be "guarded" and "safe." He said sanctions were not discussed at his meeting with Putin, which took place Friday. "Nothing will be done until the Ukrainian & Syrian problems are solved!" he tweeted. The highly-anticipated meeting between Mr. Trump and Putin on the sidelines of the summit came amid continuing probes into Trump campaign associates' ties to the Russian government, and just one day after Mr. Trump himself claimed that Russia "could have" been responsible for hacking into the U.S. presidential election. Only a handful of people were present at the meeting, including Mr. Trump, Secretary of State Rex Tillerson, Putin, Russian Foreign Minister Sergey Lavrov and their respective translators. Tillerson told reporters after the meeting that the Russians have asked for "proof and evidence" of election hacking. But at a press conference on Sunday, Tillerson said the issue of Russian meddling is still an "obstacle" in improving the U.S.-Russia relationship. "The point was made that this was an issue that really has the American people quite concerned and again it too stands as an obstacle to our ability to improve our relationship between the united states and Russia and it needs to be addressed in terms of how we assure the American people that interference in our elections will not occur by Russia or anyone else," said Tillerson. He added while he is unsure Russia will ever come to an agreement on the issue of meddling, "the important thing is how do we assure that this doesn't happen again." Lavrov however, offered an opposing account of Friday's discussion, saying Mr. Trump had accepted Putin's assertion his government did not meddle in the election, saying Mr. Trump had told the leader "some circles continue to pump up the topic of Russian interference in the American elections though they can't prove it." Putin himself addressed the interactions at a Saturday press conference at the conclusion of the summit, saying to ask Mr. Trump directly about his reaction to the claims. "[Trump] asked a lot of questions on this subject, I was able to answer -- answered all of these questions. I think he took this into consideration and agreed, but, in fact, how he reacted to this -- ask him," Putin said. On Sunday morning, Mr. Trump went on to say that "questions were asked about why the CIA and FBI had to ask the DNC 13 times for their server and were rejected." He questioned, as he has before, "why did Obama do nothing when he had info before election?"